Warwick Valley High School is proud to recognize senior Erin Flannery as this week’s Bill Garcia Agency Allstate Student-Athlete of the Week. 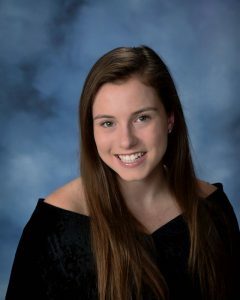 Section IX title in Class B.
Erin is the 2019 Class Valedictorian ranked #1 in a class of 328 with a weighted grade point average of 104.6. Her classes include Advanced Placement for college credit in government, literature, university Spanish, honors French and science research. She is an active member of the National Honor Society, Mu Alpha Theta Math Honor Society, Student Senate Vice President and Environmental Club Member. In her limited free time she has taken on the role as Golden Project Award Coordinator. relations. She is the daughter of Dan and Tammy Flannery of Warwick.